Schematics showing the generation of contaminant and BV2-mutant constructs. A, Contaminant manufacture by gene sequence overhang extension. In this method, (1) two template fragments are modified using mutational primers in a PCR, (2) the fragments are purified and mixed and then (3) annealed and amplified using gene-specific primers. The final contaminant template (4) contains a 20-bp mutation in the TCRBC gene region. The V-D-J sequence is unaltered from the wild-type template. B, Generation of BV2-mutant construct. Upstream and downstream fragments of a TCRBV17S1 template (□) are mutated by PCR to include StyI and BamHI restriction sites, respectively (1). Part of the V region of a TCRBV2S1 template (▧) is also amplified to include a BamHI restriction site (2). All fragments are cloned and sequenced. 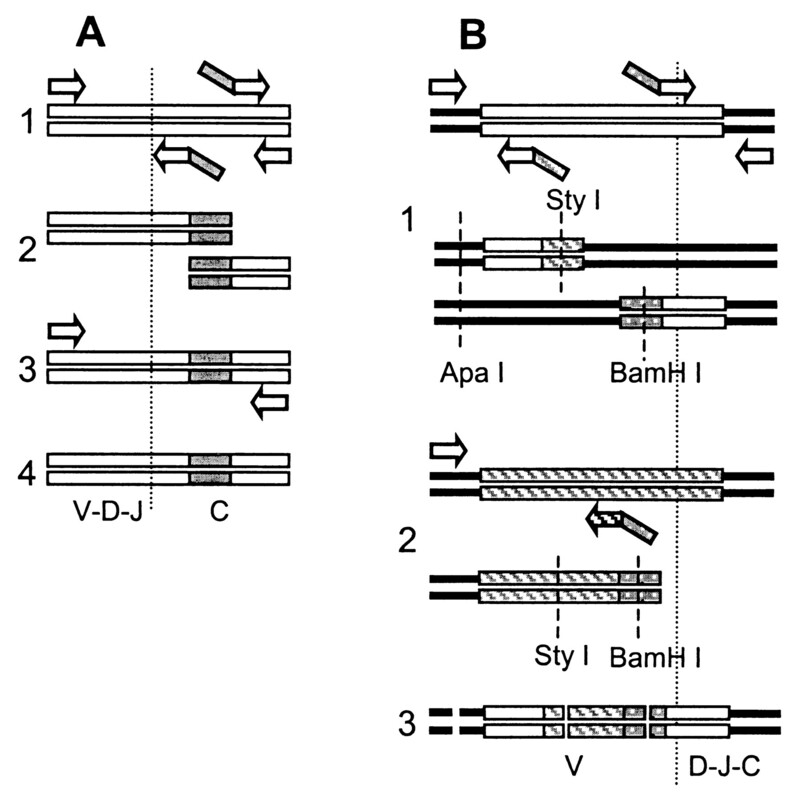 The upstream TCRBV17S1 fragment (released by ApaI and StyI restriction) and the BV2S1 fragment (released by StyI and BamHI restriction) are simultaneously cloned into the ApaI- and BamHI-restricted vector containing the downstream fragment of TCRBV17S1 (3). 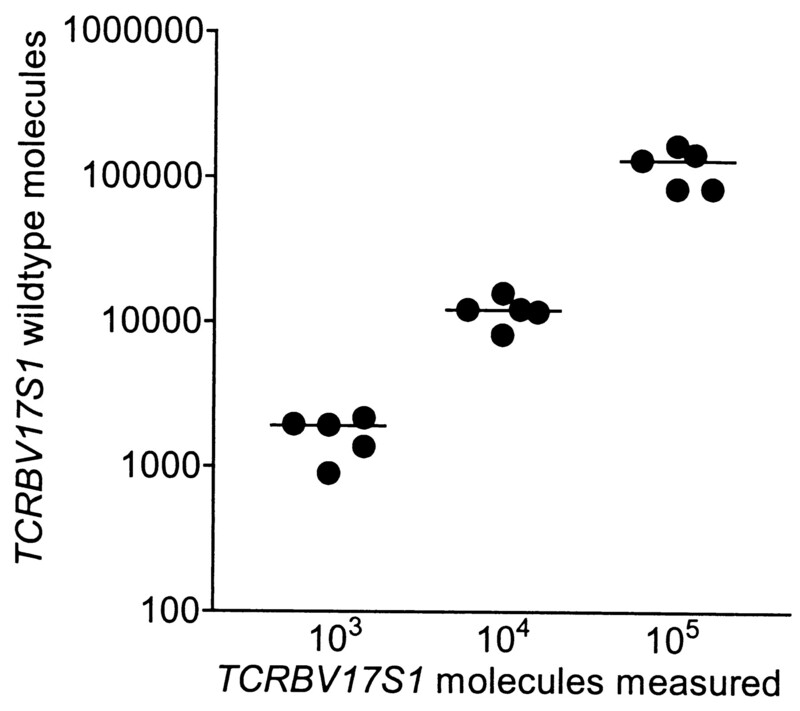 In this way, a portion of the TCRBV17S1 V region is mutated to resemble the equivalent part of the TCRBV2S1 V region. The D-J-C sequence of the original TCRBV17S1 template is unaffected by this procedure. These diagrams are not drawn to scale. The specificity, sensitivity, and relative affinity of the wild-type (WT) and mutant (MUT) template-specific probes in the PCR-ELISA method. Shown above are the OD readings (mean ± SEM) obtained from 5 pmol/ml wild-type- (•) and 1.875 pmol/ml mutant-specific (○) oligomer probes annealed to purified wild-type (A) or mutant (B) PCR products amplified from various numbers of plasmid template molecules and attached covalently to an amine-coated ELISA plate. C, Also shown is the correlation between the optical densities obtained from these two probes annealed to the purified, covalently bound amplicons derived from a plasmid construct containing equimolar amounts of wild-type- and mutant-specific probe sites. The numbers of initial “double-construct” plasmid molecules amplified in each reaction ranged from 0 to 106. The line shown has a gradient of 1.00, passes through the origin at 0.00, 0.00 ± 0.01, and has a r2 value of 0.99 ± 0.02. The accuracy of measurement of a cloned TCRBV17S1 wild-type template using the PCR-ELISA method. Shown are the medians and individual measurements of pre-determined numbers of molecules of TCRBV17S1 templates made using the PCR-ELISA method. Time course of the TCRBV17S1 mRNA response to SEB. 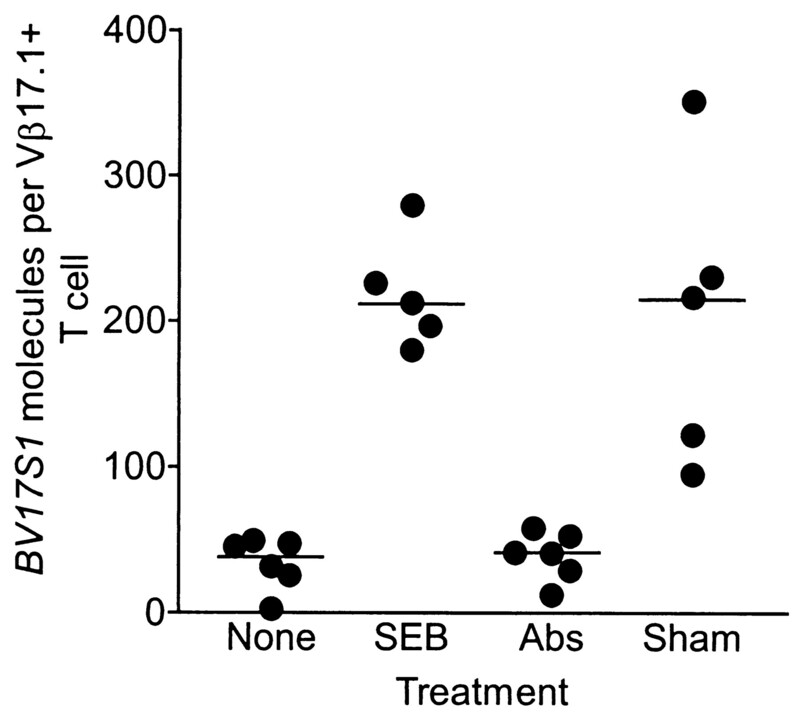 Shown are the mean ± SEM peripheral blood Vβ17.1+ T cell TCRBV17S1 mRNA levels obtained at various times after culture in the presence of 100 ng/ml SEB (•) or its absence (○). In this and all subsequent experiments, specific T cell numbers were determined at each time-point tested. Up to 7 days no significant increase in cell number was observed. The TCRBV mRNA responses to the superantigens SEB, SEC-1, and SEC-2. Shown are the numbers (mean ± SEM) of both TCRBV3S1 mRNA molecules per Vβ3.1+ T cell and TCRBV17S1 mRNA molecules per Vβ17.1+ T cell obtained from the PBMC of a single individual cultured for 3 days in the presence of medium alone (□) or medium supplemented with SEB (▨), SEC-1 (▦), or SEC-2 (▪), all at 100 ng/ml. 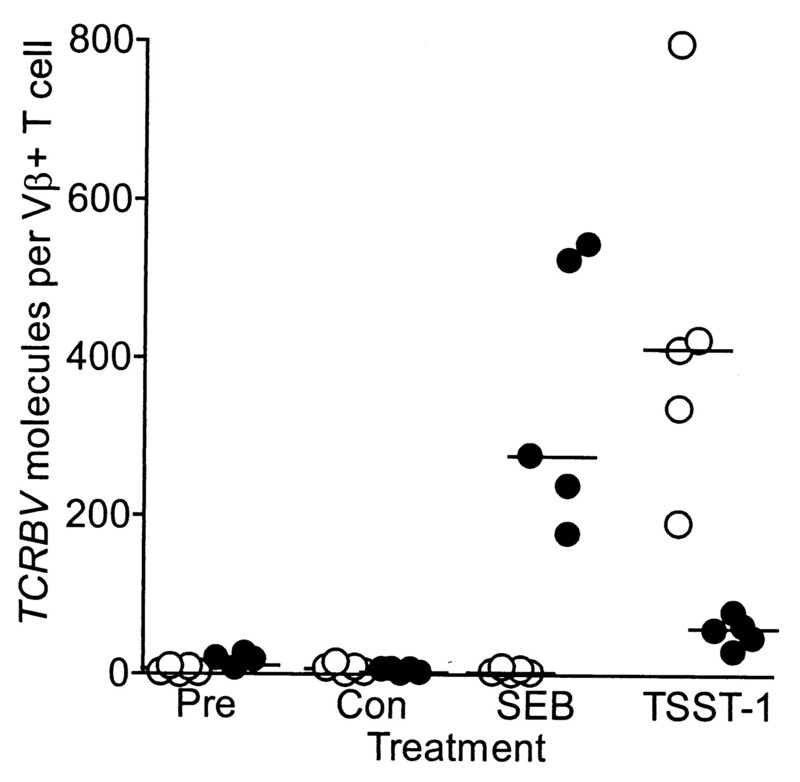 The TCRBV mRNA responses of five different individuals to the superantigens SEB and TSST-1. Shown are the numbers of both TCRBV2S1 mRNA molecules per Vβ2.1+ T cell (○) and TCRBV3S1 mRNA molecules per Vβ3.1+ T cell (•) obtained from the PBMC of five subjects either before (Pre) or after 3 days culture in the presence of medium alone (Con) or medium supplemented with either 100 ng/ml SEB or 10 ng/ml TSST-1. 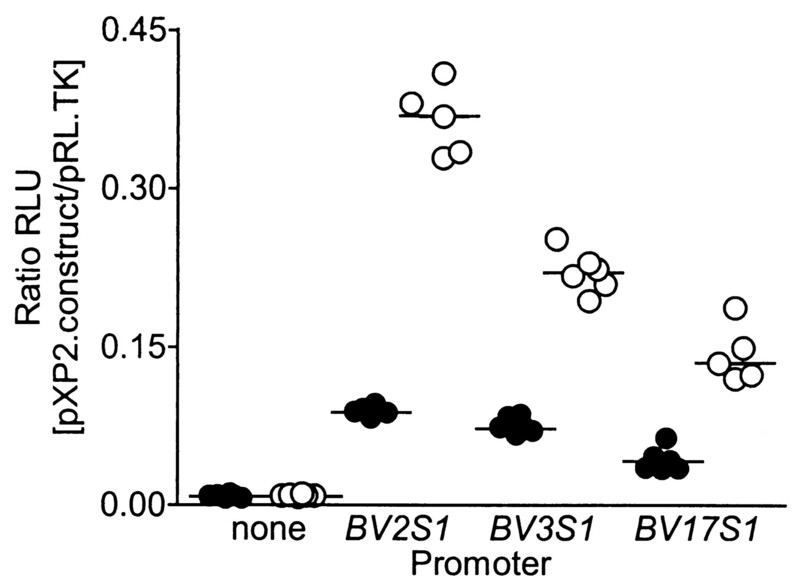 The TCRBV2S1 mRNA response of the T cell clone, AY27, to a variety of different Ags. Shown are the numbers of TCRBV2S1 mRNA molecules per Vβ2.1+, and anti-HLA-DRB1*0401-specific cloned AY27 T cell obtained after 3 days culture in the presence of various stimuli. These cloned T cells (106/ml) were cultured in the presence of 105/ml irradiated, allogeneic, HLA-DRB1*0401+ EBV B cells (DAL); 105/ml irradiated, syngeneic EBV B cells (CHOP40); or 105/ml irradiated, syngeneic CHOP40 B cells supplemented with either 100 ng/ml SEB or 10 ng/ml TSST-1. The effect of Ag depletion on the ability of culture supernatants to induce increased TCRBV17S1 gene transcription. Shown are the numbers TCRBV17S1 mRNA molecules per Vβ17.1+ T cell obtained from the PBMC of a single individual cultured for 3 days in the presence of medium alone (None), 100 ng/ml SEB, or culture supernatants removed from mononuclear cells incubated with 100 ng/ml SEB for 3 days previously. 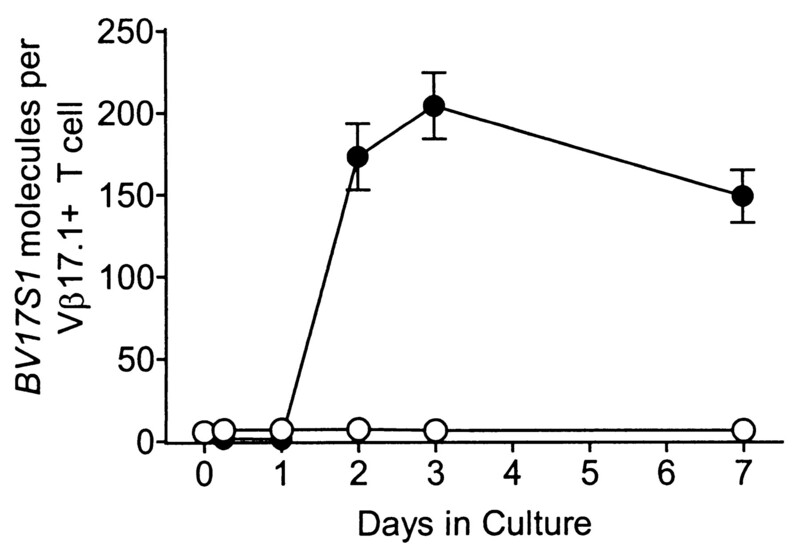 These culture supernatants were passed through columns containing normal rabbit Ig (Sham) or affinity-purified rabbit IgG anti-SEB (Abs), and covalently linked to CNBr-activated Sepharose 4B beads before being filter sterilized and added to the cells above. 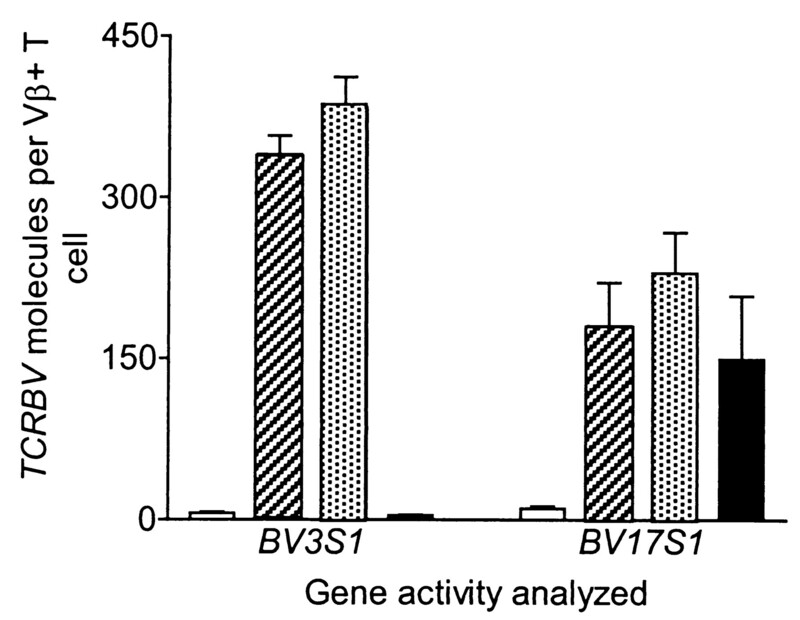 The basal and stimulated activities of the TCRBV2S1, TCRBV3S1, and TCRBV17S1 promoters in a reporter gene assay. Shown are the ratios of relative light units (RLU) measured from the experimental pXP2 vector divided by those obtained from the cotransfected control, pRL.TK, obtained from lysates of Jurkat T cells transfected by electroporation 40 h earlier. The pXP2 firefly luciferase-expressing vector that was transfected contained either no promoter (none) or ∼300 bp of upstream promoter from the TCRBV2S1 (BV2S1), TCRBV3S1 (BV3S1), or TCRBV17S1 (BV17S1) genes. Transfected Jurkat cells were cultured in the presence (○) or absence (•) of the phorbol ester, PMA (10 ng/ml). Each point represents a separate transfection.